In the spring of 1967, the area of Aurora was given to the Missouri Synod of the Lutheran Church to pioneer and establish a church. Long time resident Ric Mattmueller was given the assignment to canvas the Aurora area for available property close to Rts 43 & 82. The present church property was purchased in 1968 along with the house and lot directly to the north which was initially rented out with the intent that it would become a parsonage. In the spring of 1969, our District President announced that a soon to be ordained pastor would be sent to Aurora. Our first pastor, Arthur Umbach, arrived in July of 1969. A place for worship was needed for the 31 charter families, and the gym at Miller School was soon rented for that purpose. 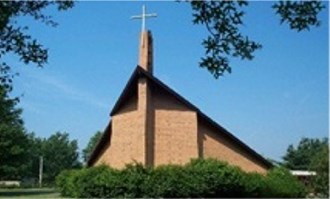 The first church service was held on November 22, 1969, and in March of 1970, Hope Lutheran Church was officially organized and acquired its charter from the Ohio District of the Lutheran Church Missouri Synod. A building committee was formed in 1971 with several architectural and budget revisions taking place before the committee set about acquiring building permits. The City of Aurora would not issue building permits since the design of our church did not comply with the true Western Reserve Standards. At that time, no standard was on the city's books, but was largely the opinions of an appointed Board of Architectural Review. The final meeting before the board had many of Hope's members present along with members of the Our Lady of Perpetual Help Catholic Parish for support of our position. A building permit was finally issued in April of 1973. The first service in our new sanctuary was held in January of 1975. Worshipers then and now sit on pews donated by the congregation of Our Lady of Perpetual Help (Solon). A ceremony dedicating Hope was held March of 1975. In the fall of 1976, Hope Christian Nursery School was licensed by the State of Ohio. Our nursery school continues today and had grown beyond our walls, so we had an extension campus at Aurora Mennonite Church. Our facilities had remained unchanged over the last 30+ years. A new expansion was completed in 2008, and now all classes are housed at Hope.